Equipped with a powerful 500-watt motor, this professional-grade countertop blender works great for parties or everyday use in the kitchen. The appliance provides six stainless-steel blades, two of which are serrated, for chopping, crushing, and blending. So whether it's liquefying frounceen fruit, whipping up creamy smoothies, or making pureed soups, the blender can handle the toughest blending chores, even crushing ice. In addition, its simple control dial makes it easy to choose from four settings that include, low, high, pulse, and off. The blender also comes with a large 48-ounce glass jar, which offers a generous handle, a drip-free spout, and a tight-fitting plastic cover with a removable filter cap for adding ingredients during operation. Other highlights include a brushed stainless-steel base, a safety lock, non-slip feet, and an embossed Kalorik logo. The jar washes up quickly by hand, and the base can be wiped clean as needed. 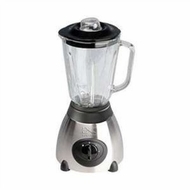 The blender measures 7-1/4 by 7-1/4 by 15-1/2 inches and carries a one-year limited warranty.